(Los Angeles) – USC saw a 14-0 halftime lead disappear in the third quarter and went on to lose to California 15-14 Saturday night before 56,721 at the LA Coliseum. The Trojans went up by two scores in the first half on two touchdown passes from JT Daniels to Tyler Vaughns, but the entire lead was erased in the first nine minutes of the third quarter and USC could never get it back. The Trojans punted the ball away to Cal with 4:50 left in the fourth quarter and never saw it again as the Golden Bears ran out the clock. The Trojans tried a fake field goal on their first possession of the game but the kicker, Michael Brown, after receiving a pass, was stopped short of the first down. 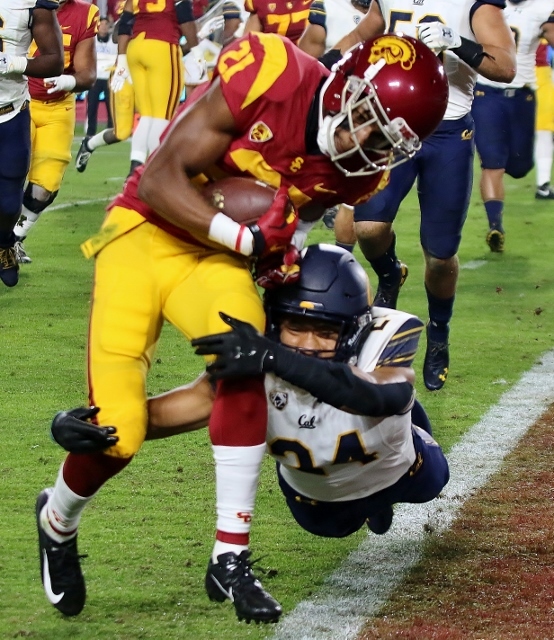 The Trojans appeared to have forced a turnover on the ensuing possession when Jonathan Lockett jarred the ball loose from Cal receiver Moe Ways and John Houston Jr. scooped it up and returned it down the field. But after a review the receiver was ruled down before the ball came out. The Trojans drew first blood however when Aca’ Cedric Ware’s 44-yard run led to two-yard touchdown pass from Daniels to Vaughns for a 7-0 USC lead early in the second quarter. Later in the quarter the Trojans drove 51 yards on six plays for a score. Daniels hooked up with Vaughns again for a 23-yard scoring toss and a 14-0 lead. On the drive USC converted a fourth and six from the Cal 31 on a seven-yard pass to Amon-Ra St. Brown. Ajene Harris stripped the ball causing a Cal turnover to set up the Trojans’ possession. USC had a golden opportunity to put more points on the board with less than a minute left in the half but St. Brown fumbled at the Cal five yard line and the Golden Bears recovered. The Trojans took the 14-0 lead into the break. That missed opportunity proved to be costly. Daniels had thrown for 147 yards while completing 10 of 15 at the half. Ware had 10 carries for 76 yards. Vaughns had five catches for 71 yards and the two scores. The momentum swung quickly in the third quarter. On the Trojans first possession of the third quarter a bad snap sailed over the head of Daniels and into the endzone where USC recovered resulting in a safety for Cal. The Golden Bears struck just one minute later needing just three plays to go 50 yards. Chase Garbers hit a wide open Vic Wharton III for a 29-yard touchdown and just like that, less than three minutes into the third quarter, it was 14-9. Traveon Beck intercepted Daniels on the next series to set up California at the USC 40. Nine plays later, Garbers kept it and danced into the endzone for a seven-yard score to give the Golden Bears a 15-14 lead. A two point pass attempt failed but with 6:13 left in the third quarter Cal had the one point advantage. It was a lead that the Bears never relinquished. USC and Cal exchanged punts over the next four possessions. USC punted the ball away to Cal with 4:50 left in the fourth quarter. The Golden Bears took over at their own 46 yard line. Cal converted a fourth down and one at the USC 33 with a 14-yard by Patrick Laird run with 2:10 left. Also Cal was helped by huge unsportsmanlike conduct penalty on USC cornerback Iman “Biggie” Marshall who was caught talking trash to the Cal sideline. That infraction gave Cal a first down and after Laird’s first down the Golden Bears were able to run out the clock. Daniels completed 21 of 34 for 180 yards and 2 touchdowns, but he was hurt by the interception. Ware rushed for 103 yards on 16 carries. Vaughns had eight catches for 91 yards to go with his two scores but it wasn’t enough. For Cal, Laird had 71 yards on 19 carries and Garbers threw for 93 yards and rushed for 34 and a TD. With the win California snapped a 14 game losing streak to USC dating back to 2003. Cal is now 6-4 overall with the win and is bowl eligible. USC fell to 5-5 and has two games remaining. the Trojans face UCLA next week at the Rose Bowl before returning to face Notre Dame at the Coliseum on November 24. 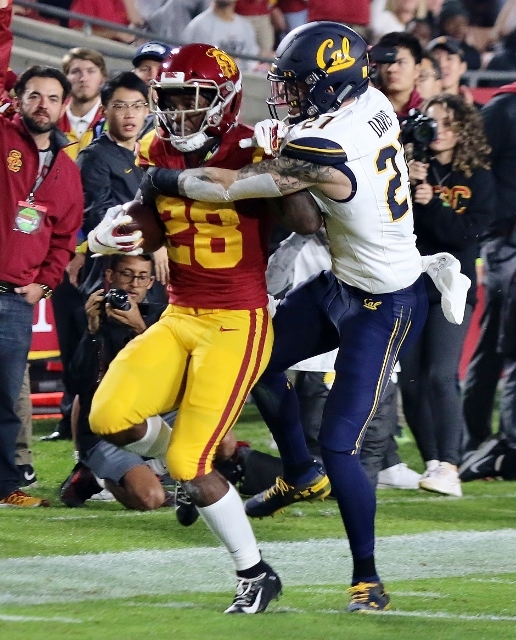 2 Comments to "Trojans Sink in Second Half, 15-14"
Will Lynn Swann meet Clay Helton on the Tarmac upon the team’s return from the 12th annual Tidy Bowl? Or, will this coach be tossed even sooner? Time for SC to find a new HC.